I am a late poster this morning! Good grief!! Let me just say that having a teenager sometimes throws things off a bit. I have a great image to share with you from Lindsay's Stamp Stuff. I also participated in a few challenges along with it. I hope you like my card. First off, the image, this is Owl on Branch and is available for purchase here. And great news!! Remember Lindsay was running a sale last month, spend $5 get a stamp free? Well it's going to be sticking around awhile! Whoo-hoo! 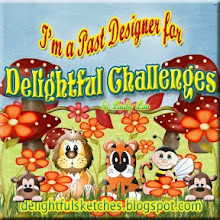 What a great way to build your collection of awesome digi-stamps quickly and saving money. I colored the image with prismacolor markers (Buff, Cinnamon Toast, Light Olive, Avocado, Dark Umber and Goldenrod). I used primas and bling from K&Company and cream colored ribbon to embellish. The sentiment I made up myself, corny, I know. 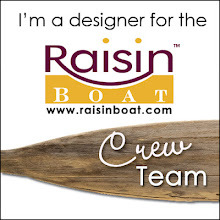 Don't forget to visit the other design team members, they are all linked in my sidebar, one of us has a free digi and it is a great image! 1) Sweet Sketch Wednesday - it's speaks for itself. Great sketch! 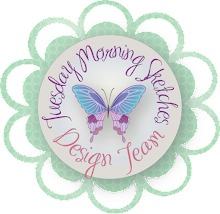 2) Digital Tuesday Challenge - a digi of course, but add some bling. 3) Color Throwdown - this was a challenge for me!! Really Rust, Pumpkin Pie, Blush Blossom and Basic Gray. Colors I use, but never together. They worked. Thanks for visiting me today. It's always a pleasure. Pretty card! I love this stamp and your sentiment is so cute with it. Love the colors you used, I just picked up a few more light prismas yesterday, the eggshell you reccomended, and some others, I can't wait to use them! Love the soft subtle colours. Thanks for using our sketch and taking part this week at SSW. Such a cute image! 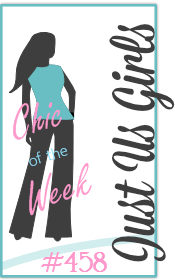 Thanks for using our CTD colors this week! Wow 3 challenges! You go girl! I know what you mean about late posting. I got in bed last night at 11:30 and realized that tomorrow was thursday! Oh crap! I totally let the week slip by. So I got out of bed, made my card and posted it at about 1:00am. Yawn! Great looking card! I love that owl! Your owl card is just darling. Thanks for joining us @ SSW. Very pretty! I was a few minutes behind today, too- it was my twin girls' first day of Kindergarten, and I got home a few minutes later than I planned. Love the soft colors on your card! Very pretty card Mel!! Love the colors and the sweet image. Thanks for playing along with us at SSW!! Nice job!! I started a card for color throwdown- will need to get it finished tonight. What a adorable a owl. Your card is so SWEET! Thanks for playing along with us at SSW!!! What a cute owl stamp! And I love the sentiment! Glad you took the challenge and took the Throwdown on! Your card is terrific! Great combination of all your challenges! I love that cute owl! Thanks so much for playing along with us at Sweet Sketch Wednesday! Such a cute card! 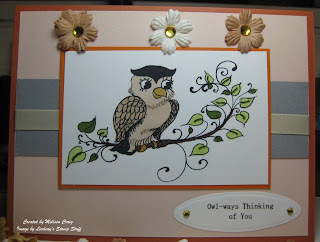 I love the owl image and your use of color and materials! Great job! adorable image and fantastic card! Beautiful subtle, soft colors...really pretty! Don't feel bad! I'm still running behind!! Your card is great! 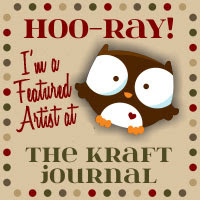 I love that owl stamp I almost used that one this week to! You did a great job with the coloring! TFS!! Love your flowers, bling and owl. Stunning job with the color throughdown challenge. What a cute owl! Great job with the challenge. Thanks for playing along. I love that stamp! Great job and the sentiment is perfect! What a cute owl! Adorable card! Thanks so much for playing the CTD! Gorgeous card, I love the image...adorable. Thanks for joining us at DTC and good luck. Very prett card. I love that image. Thanks for joining us at The DTC. How did I miss this? I love this owl - he is so wise and sweet! :D Great color combo for him, and way to go on the challenges! !